INTRODUCTORY OFFER: $500 OFF any charter booked before Dec. 14, 2013. ZUMA offers a forward master suite with walk-around king size bed with a private en-suite head with electric toilet and shower. Aft she has two cabins each with a double berth which are twins with the insert removed, each cabin has a private bath with electric head and shower. 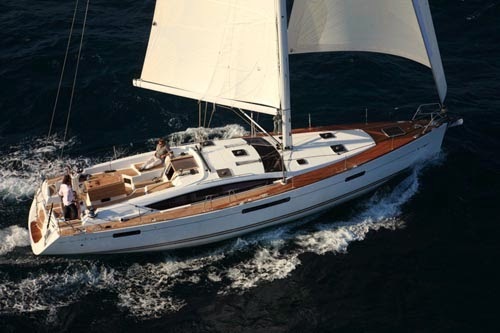 The yacht is bright and airy and has full air-conditioning for your comfort. NOTE: photos are of sister ship and interior of Zuma has brown leather interior not off-white. Forward master walk around KING bed with ensuite electric head shower. Aft double cabins each have inserts which remove to make two twins. Each aft double has a private head and wet shower.